Eeee… d’ya reckon if I sneak this up here at 3am no-one will notice? It’s in them there Aussie rules that I’m to post it up on my blog. It’s bad… it’s really rather horrific. Car crash cosmetics. The worst of it is… it took me bloody ages! Oh god… ok… Today’s news is tomorrow’s fish wrap and all that. I’ll post heavily afterwards to push it onto page 2. So, inspiration… what was I thinking? WHAT WAS I THINKING?! 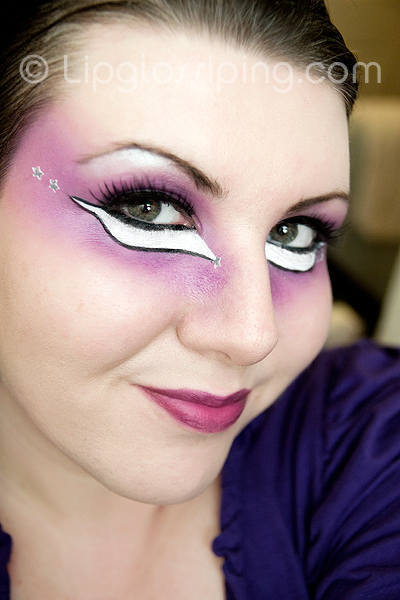 Well, the colours are representative of the Aussie Hair logo… Purple and white is synonymous with the brand no? One of the top things that springs to mind when I think of Aussie is fun-loving!! 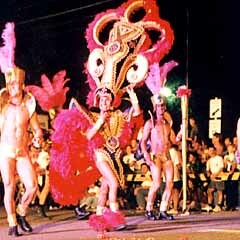 Combine that with it’s home territory and what is more fun loving than the annual Sydney Mardi Gras? Which goes some way to explain why I went for something a little more ‘out there’! Oh and the stars! 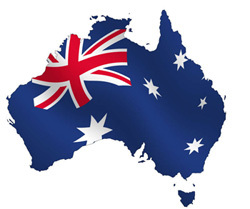 Musn’t forget those… well they’re in the Aussie flag of course!! Very important considering the amount of natural and native ingredients that can be found in some of our favourite Aussie Hair products! So anyway, that’s my competition entry and despite my current embarrassment I had *so* much fun doing it. Thanks Aussie for making me think outside of the box. If you haven’t entered the competition yet, you’re running out of time!! It’s open internationally (cos who says that it’s just us Brits who love a bit of Aussie?). You have ’till Monday to get your entries in. Just show me… what is Aussie all about to you? What are you talking about!? I think it looks good! Way better then I could do! You should enter my winter contest! You look fabulous!!! Good Luck!! If this is a disaster, I don’t want to see what your best work is like! You’ve done a great job with this entry! I love how you put all the different elements together. Well done and good luck! This is amazing, honestly it is! Good luck with your entry, you should be really proud of yourself! My entry is soo crap lol! Very ironic that you can’t get those products over here in Aussieland. Least I aint seen them? So, how do YOU pronounce L'Occitane? For the woman who has everything?